A headstrong dogmatic ‘liberal’ writing passionately advocated the celebration of Valentines Day in order to stand against the ‘anti-Valentines Day lobby’- ironically, however, in the same article he conceded to the fact that the event is highly commercialized and the celebration devoid of meaning. Call it double standards, shall we? The fabric of society is woven on the basis of a consensus of values. Since the majority in this society subscribes to the Muslim faith, this social consensus is on the values that derive themselves from Islamic tradition. The concept of Haya (modesty) is central, essential and pivotal to Islam. The Prophet (SAW) said, ‘Every religion has a distinguishing quality, and the distinguishing quality of Islam is modesty.’ The campaign in Karachi by Tanzeem e Islami (TI) highlighted this fundamental aspect of the Muslim lifestyle through ways that neither involved coercion nor vigilantism. However, this was targeted by a well-thought-out slander campaign sneering at the message in uncouth ways. This only signifies intolerance of free speech and incapacity to stomach the exercise of freedom of expression by another who differs in opinion from the self-appointed gallant crusaders of liberalism. The liberal fanatics went overboard, flying off the handle with a vicious attack on the vision and mission of TI and its leadership, including the late Dr. Israr Ahmad. The allegations levelled at the deceased scholar often veer into the personal domain. Given the fact that the target of this slander is no more there to respond to these, makes the attempt foul and malevolent. Noticeably, the real issues at hand were dexterously skirted, instead veering off into a paroxysm digging up dead ghosts to somehow prove that the TI and its work is discredited for its misogynistic, imperious, regressive tendencies. This was ‘proven’ by some isolated, obscure incidents from the early eighties that involve Dr. Israr Ahmad. Not only was this an attempt to trivialize and slight the vital message of the campaign, but in fact the entire vision, mission and work of TI and Dr Israr Ahmad. The TI is not a political organization, but believes that the social mission of Islam seeks culmination through the use of political power with responsibility for the service and welfare of human beings. Like any organization working for reform, the TI also believes in the ideal of a globally ascendant paradigm of justice and peace overstepping schisms and boundaries. The universal maxim of ‘think globally, act locally’ that the Tanzeem seems to have adopted, does not imply imperious, expansionist or violent political agendas. Instead, the TI is committed to work at the grassroots through spiritual and moral rejuvenation which alone can be the basis for any larger social reform programme. The issue of Dr. Israr Ahmad’s views on televising cricket matches seems to have been brutally manipulated and greatly exaggerated. Interestingly, the misrepresentation of Dr. Israr’s suggestion to not show cricket matches on T.V was addressed by the late scholar in 1983 in a widely published public statement. On page 85 of the monthly ‘Meesaq’ of March 1983, Dr. Israr Ahmad explains his stance. He clarifies that his objection was based on the fact that these sporting events are spread over five days and often viewers abandon more important duties and become negligent towards religious observations. It interferes with the daily routine taking away precious time. He moves on to suggest that such long sporting events should not be televised and that those interested should visit the venue to watch it live. However, if cricket matches could be of a short duration comprising a few hours in a day, it could provide healthy entertainment on T.V. This public statement does not mention the issue of women watching males on T.V even implicitly, because that had never been Dr. Israr Ahmad’s grounds for objection. The writer exaggerates this episode and Israr Ahmad’s insistence on promulgating the Islamic dresscode for women to the extent that it comes across as the primary reason why he eventually lost favour with General Zia ul Haq and fell out with him. This claim is absolutely ludicrous. While it is true that the scholar held high the sanctity of the modest Islamic dresscode and propagated the idea, it is false that his stubborn and relentless insistence made him impossible to deal with, leading to differences with the President and exit from PTV. In the Meesaq issue of February 1983, Dr. Israr Ahmad’s address to the president on this issue has been transcribed. The tone in which he suggests the observance of the Islamic dresscode on TV is merely advisory, humble and at best persuasive but never dictatorial, stubborn or threatening. Sincerity and hope rings clear out of it, which commands deep reverence for him- even if one does not agree with the import of it. The actual reason why Dr. Israr Ahmad eventually parted ways and refused to appear on the state-owned media was because the President-General had hoped Dr. Israr’s political rhetoric would justify and lend strength to his authoritative rule. He hoped for his dictatorship to somehow fit into and be sanctified by the ‘Khilafah’ ideal of Dr. Israr Ahmad. The late scholar however eventually saw through this and realized that religion was just being used to prolong the autocratic regime. There was little sincerity in actually making the values and principles of Islam prevail. Not only did his TV appearances finish, he also resigned from the ulema council, refusing to be part of an autocratic regime using religious rhetoric to maintain its hold. At the end the writer refers to an incident in which Dr. Israr Ahmad was witnessed to have hurled an abuse at a woman who was not covered in the way he would have wanted her to be. While I am not in a position to categorically refute this, whatever little I know about the late scholar and his impeccable personal morals, belies the likelihood of this. However, having said that, bringing up an issue that challenges the personal dignity and integrity of a deceased scholar who can no longer explain, clarify or refute it, and then using the dubious episode to discredit the overall message of the campaign promoting a basic Islamic value is a filthy tactic. It is hitting below the belt. I wouldn’t bother digging into this one. The malafide intent behind this self-defeating endeavour lies bare. While the audacious claims against Dr. Israr are highly dubious and quite dispensable, this much emerges clear: the writer’s own moral condition is pathetically abysmal. A sage warned that when you spit against the wind, it comes back into your own face. Bravo! May Allah reward you for standing for the truth. May Allah give us all enough courage to perform the duty of Amar bilmaroof wa nahi anilmunkir. Exellent way to defend your stance.Brilliant! Neither do we accept the ultra-liberalists and their apologists nor do we accept the ultra-conservatives and their countless ‘English-medium educated’ apologists. We demand a rational, progressive, moderate, and educated Pakistan, free from the hold of the evil mullah brigade and the stupid ultra-liberalists. Well said! Defended the great Dr Israr very well! Jazakallah Khair! A well written article. It has addressed all the issues that were raised during this month. This article needs to spread to masses, specially the educated. apart from our religious beliefs, any thing that disrupts our life,make us ignore our prime responsibilities and lead to moral and ethical breaches is something to condemn. Valentine’s day has done more damage than construction in our society. For liberals who do not find any harm in it, they must first promote health, education and female violence related causes especially among our youth before advocating this useless event. when we are done with these burning issues, then they can freely go on and spread “LOVE” for all their pleasure! TERI AWAZ MACCAY MADINAY. 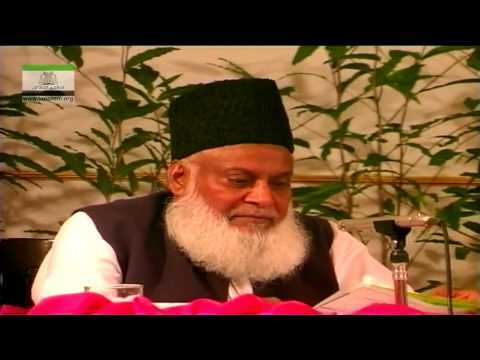 Dr. ISRAR AHMED( R.A.) was the example of Patience in adversity, practical reformer and contributed his distinctive QURANIC THOUGHTS and left behind REVOLUTIONARY TEACHINGS OF HOLY QURAN and REVOLUTIONARY METHOD TO ESTABLISH ” KHILAFAH’. it was a good effort mashaALLAH.. Brilliant. Ma sha Allah. Barakillah u fee!!! Quite frankly, I think making it about TI or Dr. Israr was unfair of NFP and, in response of you. I wouldn’t write about the relevance, significant or presence of TI in Pakistan. Rather, talking about the Valentine’s Day, I think the primary contention that ‘liberal fascists’ have when it comes to such events is simply this: are we killing people? No. Are we harming you physically? No. Are we somehow hurting you, in objective terms? No. Then please enjoy your religiosity and let us be. The very problem with all religious organizations, parties etc, including TI, is this: they want to take a moral high ground in advocating their views, but can’t tolerate it when someone contradicts them. 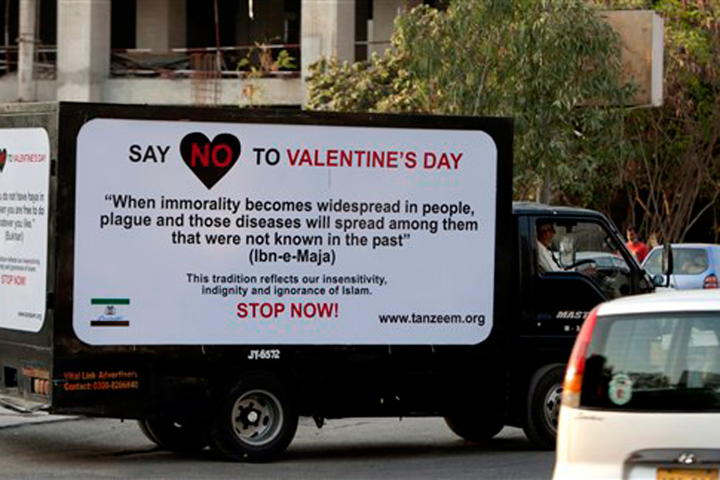 Just imagine: if some liberal fella planted a huge billboard advocating that people should actively celebrate Valentine’s Day, how would TI feel about it, or any other religious party for that matter? As far as Dr. Israr’s views go, I have little enough to comment on them. Even when I have absolutely no love lost for religious scholars, I think Maudoodi at least offered a better intellectual debate to chew on while Dr. Israr’s TI was simply an attempt to look different from a fast-politicizing JI.